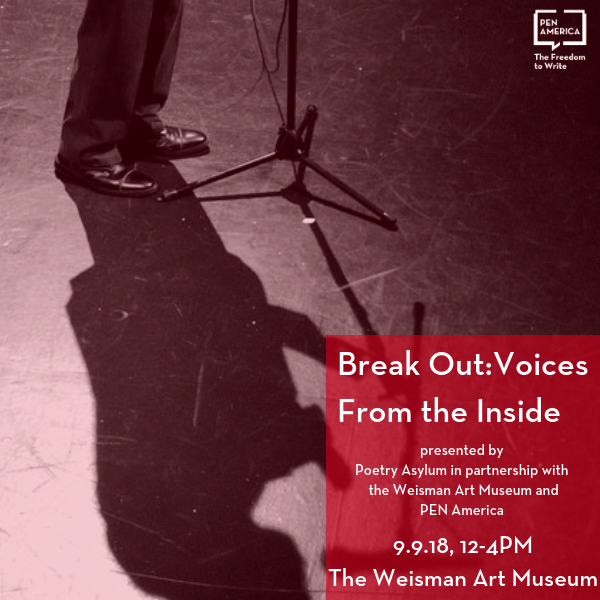 Minneapolis-based Poetry Asylum, the Weisman Art Museum, and PEN America are proud to present Break Out: Voices from the Inside, commemorating the 1971 Attica Prison Uprising and the PEN Prison Writing Program, which was founded in its aftermath and now reaches more than 20,000 incarcerated writers annually. In concert with artist Daniel McCarthy-Clifford’s “Section of Disapproved Books” project at WAM, this three-pronged event will bring marginalized voices affected personally and/or culturally by mass incarceration, activists, and scholars into the historically white space of an art museum. The event seeks to disrupt traditional privileged contexts while generating critical dialogue around futurism, abolition, and art as catalyst to healing, justice, and peace. Moderated by Sun Yung Shin and Michael Kleber-Diggs, two panels will feature ten distinguished local members from organizations including All Square, MN Prison Doula Project, MN Prison Writing Workshop, unPrison Project, Voices for Racial Justice, and We Are All Criminals. A special pre-release screening of “Cell Watch: Strip Cell,” a motionpoem by filmmaker Jane Morledge and poet Susannah Nevison, will follow. Finally, the day will culminate in an electric reading of notable works from the 2018 PEN Prison Writing Contest, which celebrates and amplifies the voices of incarcerated writers by connecting their work with the public. This event is free to the public but seats may be limited, so please plan accordingly. Light refreshments will be served in the Riverview Gallery during intermissions. Museum hours are 11am to 5pm on Sunday. Accessible and open to everyone—all are welcome.